Spondylolisthesis is defined as anterior or posterior slipping of one segment of the spine on the next lower segment. There are two classifications of spondylolisthesis. One is by Wiltse, Newman, and Macnab’s classification of and other is by Marchetti and Bartolozzi. Congenital abnormalities of the upper sacral facets or inferior facets of the fifth lumbar vertebra that allow slipping of L5 on S1. The congenital abnormalities of lumbosacral articulation include maloriented or hypoplastic facets, sacral deficiency or poorly developed pars interarticularis. There is no pars interarticularis defect. There is a defect in the pars interarticularis that allows forward slipping of L5 on S1. IThe incidence at birth is zero but rises sharply to 5% at the age of 4 to 5 years. Probably it results from fatigue fracture. Uneven distribution of isthmic ossification results in the formation of a potential stress riser in the region of pars in lower lumbar vertebrae, which could be susceptible to fatigue fracture. A large number have no complaints. This lesion results from the intersegmental instability of a long duration with the subsequent remodeling of the articular processes at the level of involvement. This type results from fractures in the area of the bony hook other than the pars interarticularis. Marchetti and Bartolozzi attempted divided the condition into developmental and acquired forms. To classify according to this classification, it must be first determined if the condition is developmental or acquired. Most spondylolistheses in children and adolescents are developmental. Normal canal dimension in the lumbar spine are fairly constant and are given below. The idea of normal values helps to determine the level of stenosis of the canal. Dysplastic spondylolisthesis forms the type I spondylolisthesis in Wiltse classification system. It is a true congenital spondylolisthesis that occurs because of malformation of the lumbosacral junction with small, incompetent facet joints. Dysplastic spondylolisthesis is very rare. But when it occurs, it is associated with fast progression and severe neurological deficits. There is a congenital insufficiency of facet joints (of S1 or L5) & disc complex, resulting in gradual attenuation of the pars interarticularis leading to ventral subluxation of L5 ventrally on the sacral facets and pedicles may get elongated as well, further contributing to the forward subluxation; This type, however, is not associated with any gap or defect in pars interarticularis. The articular processes of the vertebrae are tipped too far forward with the facet joints are facing forward (sagittal or axial) instead of sideways (coronal). Another association is malformed sacrum with spina bifida. Studies have reported a familial predisposition. Spondylolisthesis is present in 5% of the population and there is no gender difference in occurrence. This type of spondylolisthesis generally is not noticed until later in childhood or even in adult life. In children, Wiltse et al. postulated that there is some amount of hip flexor contracture. This puts weight-bearing forces on pars interarticularis. Progression of slip occurs between 9 and 15 years age and more often with associated spina bifida occulta. Only 55% had mild symptoms when followed up. A bilateral defect in pars inter articularis allows the vertebral body to slip forward and the neural arch, a loose fragment, remains behind. At the defect, there is fibrocartilagenous mass which can cause pressure on exiting nerve root. The reparative process causes cephalad pars stump to form a hook. This hook may rest on the nerve root and will need removal while decompressing. Spondylolysis was higher in athletes. The incidence differed in various sports. Developmental spondylolisthesis needs to be differentiated from acquired traumatic spondylolisthesis caused by a stress fracture. Traumatic spondylolisthesis following a stress fracture occurs in individuals with no posterior element dysplasia and with normal spinopelvic morphology. Spondylolysis is a pure stress fracture caused by microtrauma due to repetitive loading of lumbosacral spine and is typically seen in athletes. In contrast, individuals with developmental spondylolisthesis have a genetic predisposition, variable degrees of vertebral dysplasia, a sacropelvic morphology that predisposes to abnormal spino-pelvic balance. During growth, these individuals undergo abnormal development of the sacrum and pelvis which leads to altered mechanical stresses. Those associated with high pelvic incidence, low sacral table angle and high sacral slope are subjected to higher shear stresses resulting in increased tension on L5 pars interarticularis. Those with lower pelvic incidence but a high sacral table angle and low sacral slope are predisposed to impingement of L4 and S1 posterior facets with posterior elements of L5 leading to repetitive trauma to L5 pars during extension movements. Mechanical stresses play an important role in this process. This collective trauma may eventually result in a stress fracture of the pars interarticularis. Spondylolisthesis may occur when bilateral pars defects are present, which allows forward slippage of the vertebra (typically L5 on S1). Sports that involve repetitive hyperextension and axial loading of the lumbar spine may result in repetitive microtrauma to the pars interarticularis, resulting in spondylolysis and sometimes spondylolisthesis. Gymnastics, football, wrestling, weightlifting, rowing, pole vaulting, diving, hurdling, swimming (especially the butterfly stroke), baseball, tennis, sailing, and volleyball are the sports that carry the risk. Gymnastics and football are generally considered the highest risk sports. An increased risk of progression has been noted in the female gender, presentation at a young age, severe slip at the time of presentation, nonisthmic type, increased lumbosacral kyphosis and a high degree of bony dysplasia. In a skeletally immature patient, the lumbosacral kyphosis has been suggested to be the most useful predictor of progression. Degenerative spondylolisthesis was first described by Rosenberg in 1975. The most commonly affected level is L4-L5 followed by L3-L4. It may occur at two levels or even three levels simultaneously. It has also been reported in the cervical spine. Degenerative spondylolisthesis is more common in people over age 50. It is more common in women and blacks. Facet joints of the vertebral column restrain the motion of the spine [Allow flexion and extension but restrict rotational movements] while the disc itself acts as shock absorber. With age, as the degeneration sets, the facet joint may not remain competent and allow the vertebral body to slip forward on the other. With slip and enlargement of facets with time, the canal space reduces leading to spinal stenosis. Horizontalisation of the lamina and the facets can predispose for the development of degenerative Spondylolisthesis. If the dysfunction of the disc occurs in addition to these conditions, Spondylolisthesis may develop. A narrow facet angle is more prone to allow degenerative listhesis. Long-standing instability may lead to microfractures of inferior articular processes and follow by deformation. The articular processes change the direction and become more horizontal and lead to Spondylolisthesis after the age of 40 years. Women who had borne children had a significantly higher incidence of degenerative spondylolisthesis than nulliparous women. In most of the cases, the medical consultation is sought because of postural and gait problems rather than the pain. Pain is mostly backache which occurs during the growth spurt. Sometimes the leg pain may also occur. The pain in the back is due to an instability of the affected segment whereas pain the leg is due to irritation of the nerve root. Symptoms are aggravated by high activity or sports decrease on rest or with medication. Depending on the severity of the listhesis, physical findings may vary. In mild cases, there may not be any finding on physical examination. In cases with a moderate amount of slip, a step may be palpable at lumbosacral junction and motion of lumbar spine is restricted. Hamstring tightness may be felt on straight leg raising. With a further slip, the patient assumes a lordotic posture above the level of the slip to compensate for the displacement. The sacrum becomes more vertical, and the buttocks appear heart shaped because of the sacral prominence. In severe slips, the trunk becomes shortened and often leads to complete absence of the waistline. These children walk with a peculiar spastic gait called pelvic waddle or crouched gait. Scoliosis associated with spondylolisthesis may be found. The spondylolisthesis may be without symptoms or may present with dull low back pain which may radiate. There could be symptoms of claudication. The examination may reveal a step off during palpation fo the spine. Scoliosis may be present. In adults, there is insidious onset after 2nd or 3rd decade. Symptoms may start after a delivery or after heavy work. To start with, it may be a dull backache and later, radiating pain in legs on walking or standing. Disc protrusion causing compression and the neural deficit is very uncommon. Claudication denotes lateral recess stenosis, foraminal stenosis, or far out compression of the nerve root by the large transverse process. The finding of neural elements including free nerve endings within the pars defects tissue, suggests that the pars defect may be a source of pain in some patients with symptomatic Spondylolysis. The reproduction or provocation test using a treadmill was implied as a possible functional evaluation method of clinical lumbar instability. Low back pain with or without leg pain is the most common presentation. Leg pain without back pain can also be a presenting complaint. 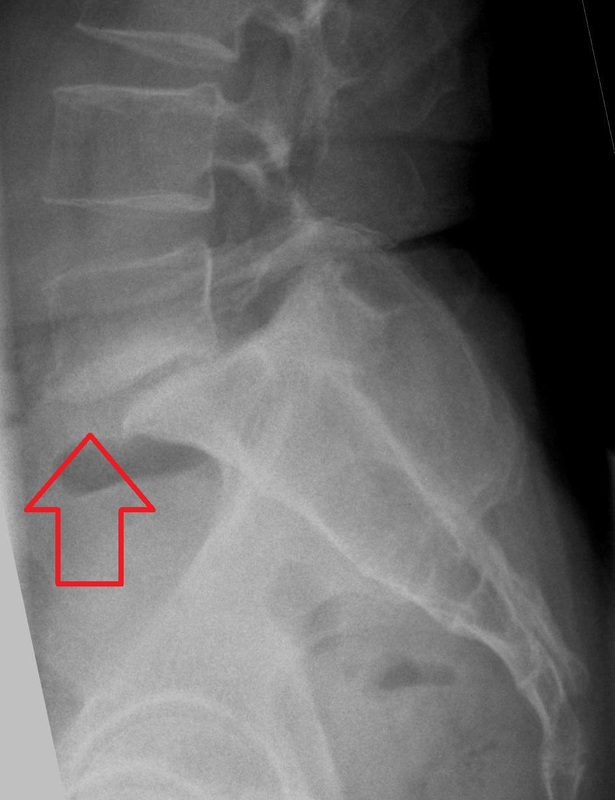 Pseudoclaudication, a feature typical of spinal stenosis may be present. Patients may have decreased symptoms while sitting or further bending as canal becomes more spacious with flexion of the spine [Similarly, space reduces on extension of the spine and increased pain may be associated with it]. Tight hamstring muscles (the muscles in the back of the thigh) and stiffness in the lower back may be associated findings. Nerve root damage is very rare with degenerative spondylolisthesis per se but decreased canal space may make the structures more vulnerable to any insult like disc herniation. With increased stenosis, the patient may not be able to walk even a few meters. Routine diagnosis of spondylolisthesis is made on radiographs. These include anteroposterior, standing lateral views and Ferguson coronal view. The Ferguson coronal view is obtained by making the x-ray beam parallel to the L5-S1 disc. This view depicts a clearer profile of the L5 pedicles, transverse processes, and sacral ala. Sometimes oblique views are also done in suspected pars defect which is not visible on routine views. Supine radiograms may not reveal listhesis. Radiograms in standing, in flexion and extension, are revealing. When Spondylolisthesis is being analyzed, to maximize motion, flexion/extension radiographs should be obtained in the lateral decubitus position. It is a predictor of instability and progression. A line is drawn parallel to the inferior aspect of the body of L5. A line is drawn a perpendicular to the posterior aspect of the body of S1 Intersection of these lines is slip angle. Radiographs are taken in standing. Higher than 55° leads to progression even after a solid fusion. Sacral inclination is an angle of intersection of a line drawn along the posterior border of S1 and true vertical line in standing radiogram. Saggital rotation is an angle formed by the intersection of a line parallel to L5 body and posterior border of the body of S1. It is also known as sagittal roll, lumbosacral kyphosis or slip angle. It is drawn by an intersection of perpendiculars from lines parallel to superior surfaces of L1 and L5 in standing radiogram. It is also called sacral angle, lumbosacral angle, and Ferguson angle. A line is drawn on top of S1 and intersected with the horizontal line in a standing radiogram and this is that angle. It has been shown that females with spondylolysis have a greater sacral angle. Lumbosacral angle is formed by an intersection of the vertical line with the line drawn on top of S1 body. More sagittal L5 – S1 facet orientation is associated with more degenerative Spondylolisthesis. Saggital rotation, lumbosacral joint angle, lumbar lordosis, wedging of olisthetic vertebrae, and the rounding of upper sacrum shows considerable statistical correlation to the amount of slipping and accordingly should be noted while estimating the risk of progression of the Spondylolisthesis. A bone scan is indicated in children where the plain film does not show any defect but the defect is believed to be present. A bone scan may show the pars defect in stress reaction stage determined by increased uptake. Mostly not needed, a CT scan can be used to differentiate between a stress reaction and acute stress fracture. [Developmental versus traumatic]. CT is the best study to diagnose and delineate the anatomy of the lesion. Tomograms can help identify fracture as well as root compression. MRI is useful in determining the extent of injury to the disc at the level of the spondylolisthesis. Nerve root compression also can be evaluated. MRI is indicated if neurologic symptoms present. It is a useful tool to diagnose associated stenosis. M R I can help in diagnosing disc degeneration and help in the decision for fusion level. The moderate grade of Spondylolisthesis in adolescents has a benign course. Spontaneous segmental stabilization occurs as a result of degeneration of the disc at the level of the slip. With a slippage less than 25% and mild symptom, non-operative treatment helps. Operative treatment is suggested for more than 50% slip. Nonoperative treatment is useful if symptoms are few and the spondylolisthesis is mild. The gradual increase in activity is allowed if symptoms improve. For nonsymptomatic patients, no active treatment is required but contact sports and high energy that might injure the back are to be avoided A follow up every 6-12 months til the completion of growth is required. Some of the options are discussed below. Progression of the slip [Indicative of a severe dysplasia]. Early surgery has benefited over delayed ones. An early surgery may prevent difficult or risky surgeries at a later time. Though fusion surgery for spondylolisthesis is generally quite effective, it is a major procedure and should not be considered until the conservative treatment has been tried for six months and failed. A slip of more than 50% in asymptomatic patients with dysplasia would warrant surgery. In the low dysplastic type of spondylolisthesis, a spinal fusion [posterolateral] between L5 and the sacrum is recommended for slips of less than 50% [mild dysplasia] in children and adolescents who are symptomatic despite conservative treatment. This degree of slippage is a mild dysplasia (low dysplastic type) usually without a significant slip angle. Instrumentation with pedicle screw is done to avoid the need of postoperative immobilization. .
Anterior release; and intradiscal graft or structural cage combined with posterior instrumentation and fusion. For grade V [spondyloptosis] L5 vertebra removal with L4 to the sacrum fusion has been described. The reduction of spondylolisthesis with instrumentation carries a risk of increased operative time, complications, and reoperations. Therefore most of the authors recommend fusion in situ [without reduction] a method of choice though reduction increases the chances of fusion itself. If a patient has a neurological deficit preoperatively, decompression of the cauda equina at the time of the arthrodesis can be considered. Postoperatively, a brace [Pantaloon brace] is worn for 3 to 4 months. Most of the patients with degenerative spondylolisthesis get relieved by nonsurgical measures and surgery is rarely required. Surgery may be considered in disabling pains not relieved by nonsurgical management and in cases of progressive neurologic deterioration. The surgery involves decompression and fusion along with spinal instrumentation. Decompression surgery ( laminectomy) without fusion alone is not advisable as it can lead to instability.